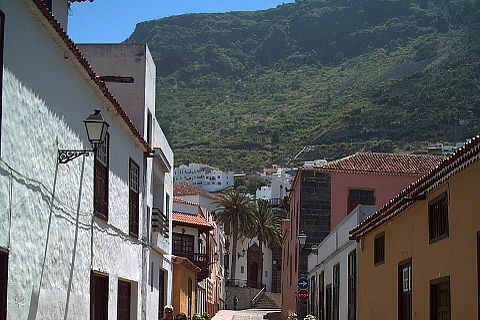 Garachico is a very pretty town on the northern coast of Tenerife in a particularly unspoilt part of the island. 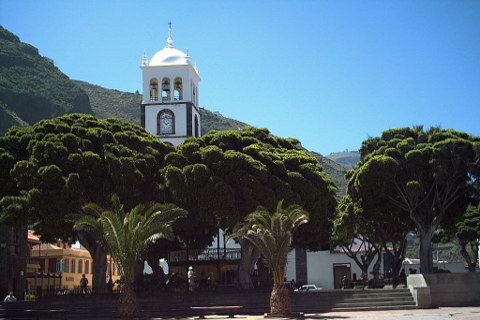 The town sits nestled at the bottom of tree clad hills and is one of the most popular destinations for a day trip on Tenerife. There are no real beaches in Garachico but the rocks have been covered in walks made of crazy-pazing with open areas to sit and sunbathe. Sounds tacky but its really rather nice! Several lovely sea-water swimming pools have been created in the volcanic rock - these are the safest places to swim as the sea here is rather dangerous for swimming. In Garachico town streets are often cobbled and narrow and there are lots of delightful buildings. 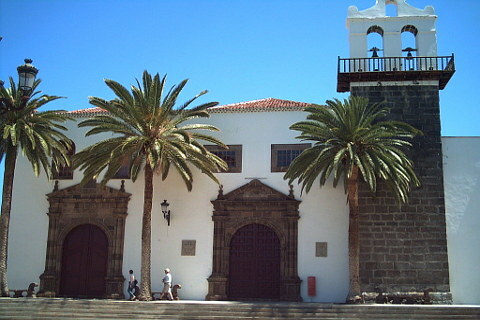 The main square, La Libertad is very pretty with its lovely churches and attractive old monastery. Much of the town dates after a lava flow destroyed much of the original town in 1706. This eruption lasted several days and filled the harbour of Garachico with larva making it unusable. Up until this Garachico was one of the most important towns and harbours on the island and was certainly one of the wealthiest. Indeed Garachico has had a terrible history with bubonic plague, volcanic erruptions, swarms of locusts, fires and floods. However strolling around the calm and pretty streets today you would never guess at its difficult past. Indeed as it was bypassed as one of the main towns following the eruption this has led to its original character surviving the intervening years better than most. The harbour too which was destroyed by the larva flow is now very attractive with its lava rock edges and natural rock pools. The Castle of San Miguel (Castillo de San Miguel) which survived the 1706 eruption and is one of the oldest buildings in the town. Inside there are displays showing the history of the town and local wildlife. In August Garachico holds its festival of San Roque when locals don traditional dress and travel in carts pulled by oxen. It is a nice, colourful occasion and a very nice time to visit. Garachico is particularly popular as a diving destination as there are volcanic columns under the water which add to the beauty of the prolific marine life that enjoys the warm waters of Tenerife. 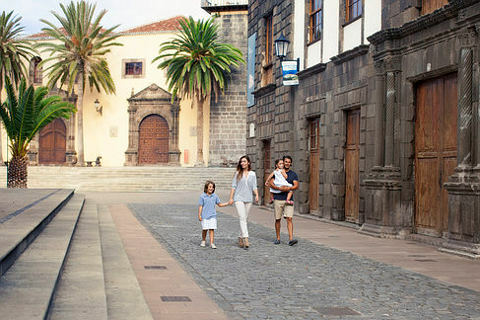 Some photos kindly supplied by Turismo de Tenerife. Masca is considered to be the most beautiful village of Tenerife and is in a stunning location in the Teno mountains. It is definitely worth a trip. For more stunning scenery head to Los Gigantes and the Los Gigantes cliffs which are huge cliffs which fall sheer into the sea. The best way to see them is by boat and as this part of the coast is excellent for whale and dolphin spotting it is possible to take one of the excellent whale watching tours and see the cliffs from the sea as a bonus.